Sale is not valid in stores- only online. Mega bag of vegetables for only 5 shekels! 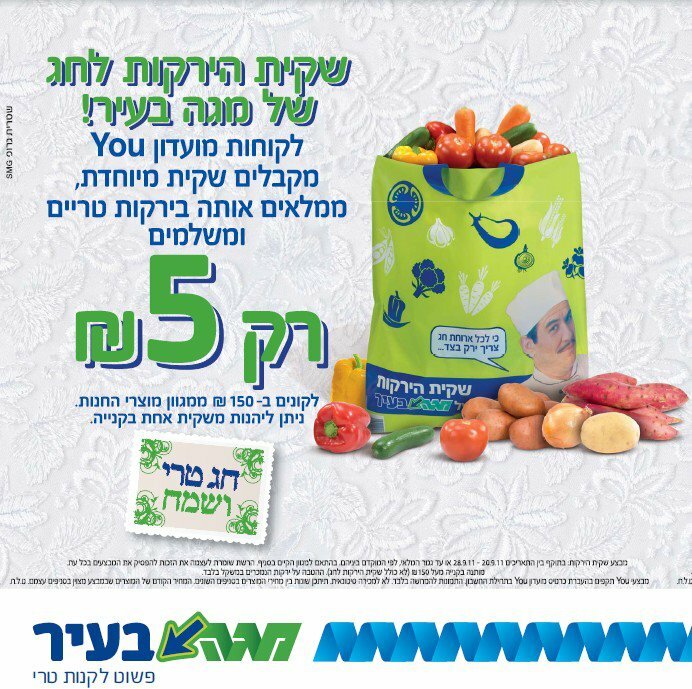 YOU members: Take an environment-friendly colorful bag at Mega BaIr (only), fill it with fresh vegetables and pay only 5 shekels for the entire bag! Limit one bag per purchase. Must spend at least 150 shekels on other items. I cannot read the expiration date- if you can, please post it. I just came back from Mega. The bag is smaller than it looks, but I was able to put in 6 leeks, 4 peppers, 3 large beets, 10 zucchini, and 6 plum tomatoes. The store I was in only allowed non-packaged vegetables and vegetables that are priced by the kilo. They also disallowed avocadoes and bananas. Oh, and the bag is plastic, not cloth.